Yellow color was worshiped in ancient China, and it was often deemed to be symbol of regality. There was an old saying in ancient China, When dragons fight, the blood they bled was yellow, and also, dragons were regarded as symbol of emperors. 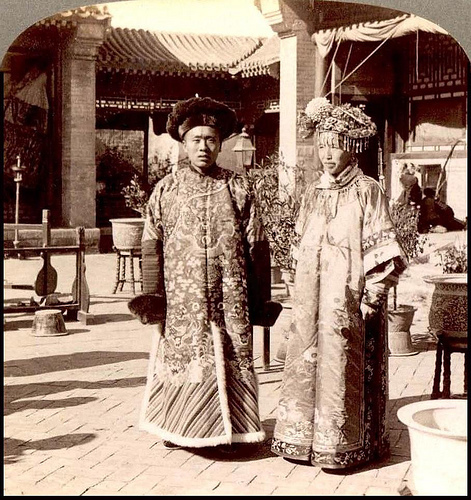 The Emperor refers to any sovereign of Imperial China reigning between the founding of Qin Dynasty of China, united by the King of Qin in 221 BC, until the abdication of Puyi in 1912 following the Xinhai Revolution. When referred to as the "Son of Heaven", a title that predates the Qin unification, the Emperor was recognized as the ruler of "All under heaven" . Chinese refers to Han Chinese, also called Han ethnic group. They are the majority of Chinese.